For Antje Roitzsch, walking in the woods every morning is a great source of inspiration. By connecting with nature and seeing the daily changes through the seasons Antje notices small things: one day grasses against the snow, another day ice formations on the little brook, or another the dead trees shaped and carved from exposure to the elements.The flow of closely observed water creates wondrous forms and swirls. The budding of new plants implies much potential. The forces that unfold fern, leaves or blossoms in the Spring are what Antje tries to capture in her 3-dimensional work. Indeed, the growth, maturation and unfolding of vegetation mirror human growth, unfolding and developing. Any observer of personal development might resonate with these forms on a deep, perhaps even unconscious level. Even though the casual observer might not recognize the organically inspired nature of Antje's refined work yet might appreciate the harmonious flow of form. Being open to a slow process of form development grew out of Antje's Waldorf education in Germany where she studied form metamorphosis with Dr. Peter Wolf. The seven stages of plant development described by poet J.W. Goethe and later by Rudolf Steiner were used as the basis of studies in clay and wood. Following her Waldorf education she studied graphic arts for two years and then completed a 4-year goldsmith apprenticeship in Germany. In 1988 the Carl Duisberg Society awarded her a grant to study the goldsmith technique of Anticlastic Raising for a year with Michael Good of Michael Good Designs in Rockport ME, USA. Antje returned to Germany to work for six months with Professor Friedrich Becker on his innovative stainless steel jewelry and kinetic sculptures. 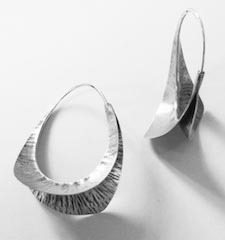 In 1990, she returned to Maine and worked with Michael Good Designs for fifteen years, designing and producing the flowing 3-dimensional shapes of this hand-crafted jewelry.